The theme of agricultural work can be found in many of Michigan's stained glass windows. Agricultural scenes based upon biblical stories or religious traditions usually appear in the churches or synagogues of Michigan. Other stained glass images reflect the important role of agricultural industry and education in our state's history. There are numerous allusions to agricultural activities in biblical texts. Scattered throughout the sacred books are references to mankind tilling the soil, sowing seed and reaping the harvest, planting vineyards and olive trees, storing grain and wine, and tending cattle and sheep, activities all related to the life of people in biblical times. Among stained glass scenes of agricultural life, perhaps the most popular are those depicting the "Parable of the Sower" as told by Jesus. Parables, short stories based on human experience, were used by Jesus to teach spiritual truths. 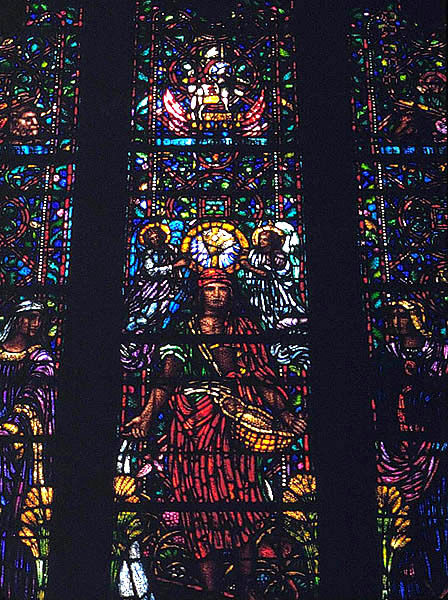 An elaborate Sower window, created in 1916 by the Willet Stained Glass Studios of Philadelphia, is located at First Unitarian-Universalist Church in Detroit. Another monumental Sower window, made by Willet Studios in 1926, is at Metropolitan United Methodist Church in Detroit. In this window, the image of a red devil at the Sower's feet is shown sowing tares (weeds) among the good seeds of wheat. When the wheat is eventually harvested and gathered into the barn, the tares will be cast into the fire, a lesson about the final judgment awaiting good and evil men. Left: "The Sower." Willet Stained Glass Studios, Philadelphia, 1926. Metropolitan United Methodist Church, Detroit, MI. MSGC 93.0034. Photo by Ernest R. Aruffo, Jr. Right: The Devil, sowing tares. "The Sower." Detroit Stained Glass Works, Detroit, MI, 1917. Trinity-St. Mark's United Church of Christ, Detroit, MI. MSGC 98.0055. Photo by Arlene Maas. 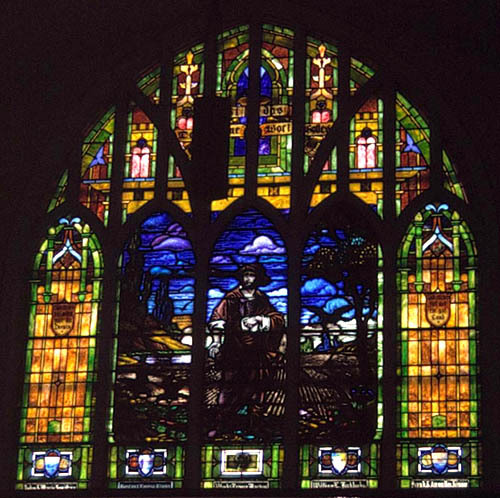 The Detroit Stained Glass Works created a large Sower window in 1917 for the balcony level of Trinity-St. Mark's United Church of Christ in Detroit. Church records note that the subject was chosen "so that the pastor, who was on the same level as the window when in the pulpit, would be reminded of the parable and how he was sowing seeds of God's word as he preached." 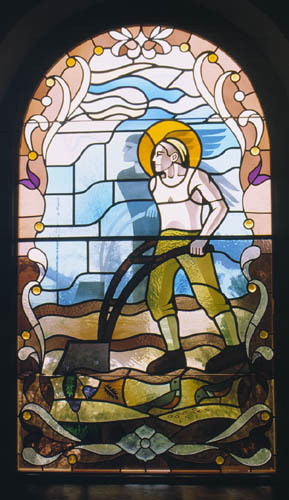 Another scene of the Sower is among several medallion-style windows made in 1957 by the Grand Rapids Art Glass Company for Trinity Lutheran Church in Manistee, MI (fig. 3). "Sowing the Seed." Grand Rapids Art Glass & Mirror Co., Grand Rapids, MI, 1957. Trinity Lutheran Church, Manistee, MI. MSGC 95.0010. Photo by William O. Hund. "Parable of the Sower." Willet Stained Glass Studios, Philadelphia, 1959. Dewey Battjes Memorial Chapel, La Grave Avenue Christian Reformed Church, Grand Rapids, MI, MSGC 94.0153. Photo by John O. Lockwood. 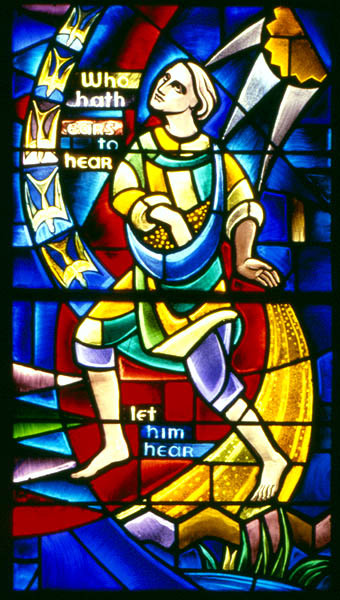 A three-lancet window in the Battjes Chapel of La Grave Avenue Christian Reformed Church at Grand Rapids illustrates several of the parable stories, including the Parable of the Sower, located in the right lancet beneath the Parable of the Good Samaritan. 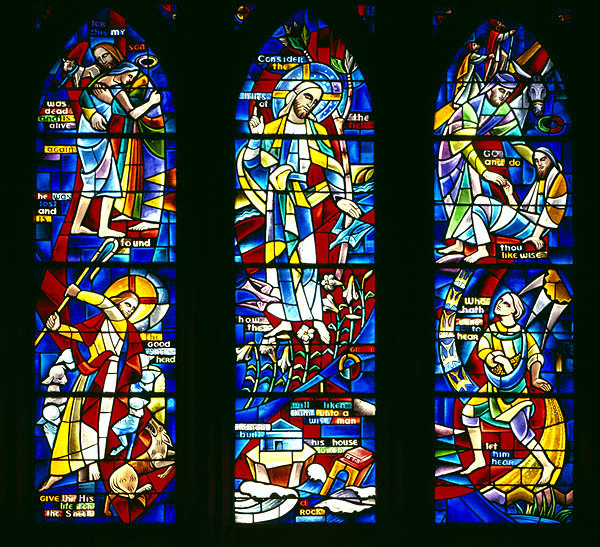 Created in 1959 by the Willet Stained Glass Studios, the stylized scene is inscribed, "Who hath ears to hear, let him hear." Left: "St. Isidore, Patron Saint of Farmers." R. W. Hornsby, L & R Design Studio, Chicago, 1991. St. Michael Catholic Church, New Lothrop, MI. MSGC 94.0106. Photo courtesy of St. Michael Catholic Church. Right: "St. Francis, the Farmer of Love." R. W. Hornsby, L & R Design Studio, Chicago, 1991. St. Michael Catholic Church, New Lothrop, MI. MSGC 94.0106. Photo courtesy of St. Michael Catholic Church. 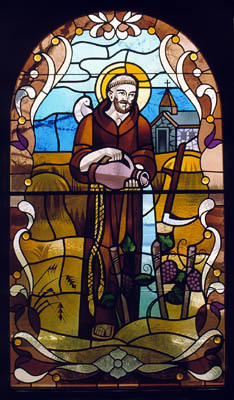 Two windows at St. Michael Catholic Church in New Lothrop, MI, created in 1991 by R. W. Hornsby of L & R Design Studio in Chicago, IL, honor St. Isidore as the patron saint of farmers (fig. 5) and St. Francis of Assisi as the "Farmer of Love" (fig. 6). The St. Isidore window depicts a farmer plowing his field, aided at his task by an angelic plowman in the background. St. Francis, who called birds and animals his "brothers," is shown pouring water over fields of grain and vines, symbolizing his love and concern for all of creation. Windows depicting the harvest season are less common than those with images of sowers. A harvest window, created by Tiffany Studios of New York for Temple Emanuel in Grand Rapids (fig. 7), depicts a tender scene from the story of Ruth and Boaz, as told in the biblical Book of Ruth. After his field of barley has been harvested, Boaz is shown pouring grain into the gathered apron of his future wife Ruth. Ruth and Boaz. Louis C. Tiffany Studios, New York, 1926. Temple Emanuel, Grand Rapids, MI. MSGC 94.0028. Photo by Deborah P. Mankoff. Apple Trees and Fish. Williams Art Glass, Oxford, MI, 1996. Paint Creek Cider Mill and Restaurant, Goodison, MI. MSGC 03.0011. Photo by Janine Saputo. The importance of agriculture and agricultural education in Michigan's history is reflected in other stained glass windows. Michigan is noted for its production of apples, cherries, blueberries, asparagus and many other fruits, vegetables and grains. 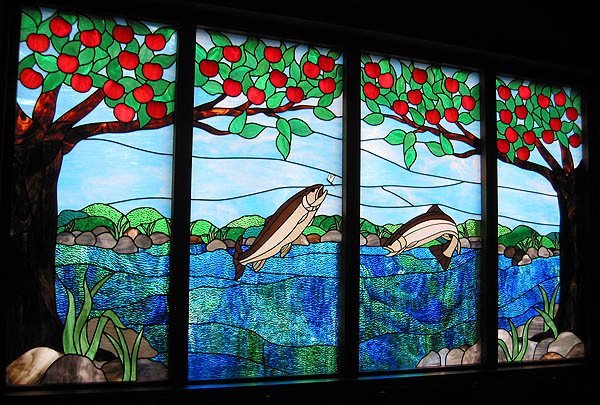 This window at the Paint Creek Cider Mill and Restaurant in Goodison, MI, reminds diners of Michigan's bountiful apple harvest, as well as its waters teeming with fish. Windows at the Alumni Memorial Chapel of Michigan State University document the major role of agricultural education in our state. Agricultural education had an early start in Michigan with the passage of the Morrill Act of 1862, which gave land to each state "for the support of colleges that would teach agriculture and the mechanic arts." Through this Congressional act, Michigan Agricultural College (the original name of Michigan State University) became the nation's pioneer land-grant university. The College of Agriculture and Natural Resources (CANR) is a major academic component of Michigan State University. Left: President Lincoln Signing the Morrill Act of 1862. Designed by Odell Prather, Willet Stained Glass Studios, Philadelphia, PA, 1952. Alumni Memorial Chapel, Michigan State University, East Lansing, MI. MSGC 92.0003. Photo by Bill Heater. Right: Farmer's Institute of 1876. Willet Stained Glass Studios, Philadelphia, PA, 1952. Alumni Memorial Chapel, Michigan State University, East Lansing,, MI. MSGC 92.0003. Photo by Bill Heater. The Farmer's Institute was established at Michigan Agricultural College in 1876 to provide agricultural information and technical assistance to Michigan's farmers. "Round-Up" meetings for farmers began in 1898 and an annual "Farmers' Week" event, launched in 1914, continues to be held each year as "Agriculture and Natural Resources Week" (ANR Week) at Michigan State University. The Smith-Lever Act of 1914 created the Cooperative Extension System to be instituted and directed by land-grant universities. The Michigan State University Extension (MSUE) program provides the expertise of county-based agricultural agents and the CANR faculty to people in every county. It also administers the 4-H agricultural education program for Michigan youth throughout the state. The Michigan Agricultural Experiment Station (MAES) at Michigan State University was founded in 1888 after the Hatch Act of 1887 created a nationwide network of agricultural experiment stations to conduct research and development projects on behalf of farmers. The Purnell Act of 1925 added agricultural economics, rural sociology and home economics to its mission. Agricultural Experiment Station. Willet Stained Glass Studios, Philadelphia, PA, 1952. Alumni Memorial Chapel, Michigan State University, East Lansing, MI. MSGC 92.0003. Photo by Bill Heater. "Living in Harmony with Nature." Nancy Truscott, Mason, MI, 1989. A. W. Farrall Agricultural Engineering Hall, Michigan State University, East Lansing, MI. MSGC 03.0006. Photo by Pearl Yee Wong. A stained glass window in Farrall Hall, the Agricultural Engineering building at Michigan State University, represents mankind living in harmony with nature through the prudent use of land, lakes and streams, a philosophy expressed through the mission statements and many programs of the College of Agriculture and Natural Resources at Michigan State University. Eppinga, Jacob D. A Century of Grace. Grand Rapids, MI: La Grave Avenue Christian Reformed Church, 1987. The Holy Bible, King James Version. (New York: American Bible Society: 1999). Published May 2000 by Bartleby.com; © Copyright Bartleby.com, Inc.
Kuhn, Madison. Michigan State: The First Hundred Years. East Lansing: MSU Press, 1955. La Grave Avenue Christian Reformed Church (Grand Rapids, MI). "A Description of Stained Glass Windows: Created for the Church to Help Tell God's Story" (booklet). Michigan Stained Glass Census file 94.0153, Michigan State University Museum, East Lansing, MI. Metford, J.C.J. Dictionary of Christian Lore and Legend. London: Thames and Hudson, Ltd., 1983. Metropolitan United Methodist Church (Detroit, MI). "A Century of Christian Witness on Woodward" (booklet). Michigan Stained Glass Census file 93.0034, Michigan State University Museum, East Lansing, MI. Stanford, Linda O. and C. Kurt Dewhurst. MSU Campus: Buildings, Places, Spaces: Architecture and the Campus Park of Michigan State University. East Lansing: MSU Press, 2002, 157. Text by Betty MacDowell, Michigan Stained Glass Census, November , 2006.